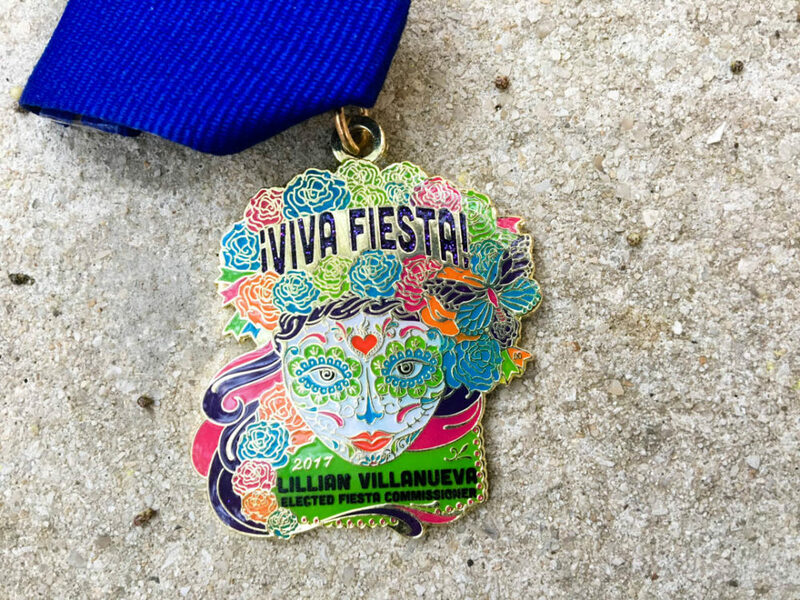 Congrats to Lilly Villanueva for winning the Individual category in the 2017 SA Flavor Fiesta Medal Contest! Lillian Villanueva is one of the admins behind the Fiesta Medal Maniacs Facebook group and she created this beautiful calavera medal for 2017. The sugar skull has an amazing Fiesta hat decorated to the max with flowers to commemorate her election as a Fiesta Commissioner—I only can wonder if she’ll sport a similar hat during Fiesta! Also featured on the medal is a beautiful butterfly that you might miss at first glance. She only has a handful left for $5 each, or you can purchase it as part of the Fiesta Medal Maniacs bundle for $20 (I think Maddie Mac Boutique still may have a few)! Be sure to read our spot on all the ladies who help give you the 4-1-1 on the hottest medals!